Rise of Shadows™ Now Live, Unleashes The League of E.V.I.L. in Hearthstone® | Activision Blizzard, Inc.
IRVINE, Calif.--(BUSINESS WIRE)--Apr. 9, 2019-- Azeroth’s most notorious villains have joined forces and are planning something nefarious involving the mystical floating city of Dalaran. 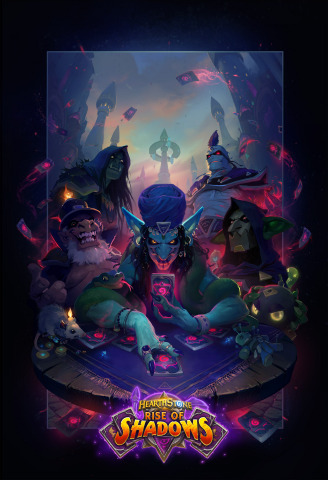 Today’s launch of Rise of Shadows™, the newest expansion for Blizzard Entertainment’s smash-hit free-to-play digital card game Hearthstone®, invites players to get in on the action with 135 all-new cards featuring mechanics and keywords expressly designed for doing no good. Unfortunately for them, the Defenders of Dalaran won’t go down without a fight. Wielding mighty Twinspells,which generate a copy of themselves in players’ hands once they’re cast, the Defenders could put a serious damper on the League of E.V.I.L.’s plans. Information in this press release that involves Blizzard Entertainment's expectations, plans, intentions or strategies regarding the future, including statements about 2019 Hearthstone content, including the pricing, promotions, release dates, features, and functionality of Rise of Shadows and the next Hearthstone Solo Adventure, are forward-looking statements that are not facts and involve a number of risks and uncertainties. Factors that could cause Blizzard Entertainment's actual future results to differ materially from those expressed in the forward-looking statements set forth in this release include unanticipated product delays and other factors identified in the risk factors sections of Activision Blizzard’s most recent annual report on Form 10-K and any subsequent quarterly reports on Form 10-Q. The forward-looking statements in this release are based upon information available to Blizzard Entertainment and Activision Blizzard as of the date of this release, and neither Blizzard Entertainment nor Activision Blizzard assumes any obligation to update any such forward-looking statements. Forward-looking statements believed to be true when made may ultimately prove to be incorrect. These statements are not guarantees of the future performance of Blizzard Entertainment or Activision Blizzard and are subject to risks, uncertainties and other factors, some of which are beyond its control and may cause actual results to differ materially from current expectations.